Have you ever witnessed a riot or large crowd that is increasingly growing more and more dangerous? Whether it be a local protest, fight, or demonstration a large group of people in an area can erupt into chaos, particularly for law enforcement officers. A major riot control agent, like tear gas can be used in many instances for security forces, but due to the nature of the chemical there are strict international guidelines in place around its use and the way in which it can be deployed against civilians for crowd control measures. How dangerous can tear gas be to human health and what can be utilized to protect yourself from this chemical agent? CS gas is among one of the most commonly used tear gases in the world. Law enforcement agencies and officials have found this agent valuable when faced with combative suspects, riot control, and for hostage and siege situations. Exposure to CS gas will cause distressing symptoms including lacrimation, eye pain, blepharospasm, a burning sensation in the nose & throat, chest tightness, sneezing, & coughing. CS gas starts to affect the environment and those exposed to it within 30 to 60 seconds after deployment. CN gas, also known as Chloroacetophenone, is the active ingredient utilized in maze, to help as a riot control or tear agent for law enforcement officials. This gas has a sharp, irritating odor that disperses upon deployment. The CN gas can be absorbed by ingestion and inhalation in humans. CN has similar affects to CS gas and can include temporary loss of balance and even permanent skin damage. Overall, the effects of CN gas last longer than that of CS gas. The active ingredient in pepper spray is oleoresin capsicum (OC), a natural oil found in many types of hot peppers. Pepper spray is usually dispensed from an aerosol canister to disperse quickly into the environment. Exposure from pepper spray can result in blisters to the skin. What Does Tear Gas Do to Human Health? Tear gas, despite its name, is not a gas, but an aerosol. 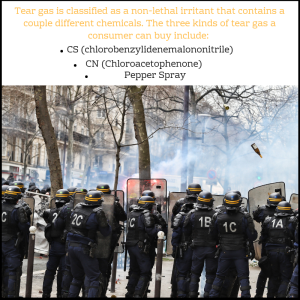 The chemical agent CS that is utilized in tear gas is a solid at room temperature and mixed with liquid or gas dispersal agents when used as a weapon designed to trigger the pain-sensing nerves. Tear gas works by triggering a reaction from the mucous membranes of the eyes, nose, mouth, and lungs. According to the Chemical Weapons Convention of 1993, signed by nearly every country in the world, banned the use of tear gas in warfare but found it legal in domestic riot control. When tear gas is deployed the chemical can create a cloud that affects the area the discharge took place. The chemical cloud will affect a person’s eyes, nose, and respiratory system – and can illicit other health reactions. Tear gas has strong and lasting effects on human health. This vapor release will potentially irritate the mucous membrane of the eyes, nose, mouth, and lungs which can lead to tearing, coughing, burning, and stinging sensations. According to German toxicologist Uwe Heinrich, the dispersion of this chemical at a concentration of one milligram per cubic meter will cause symptoms of irritation. The overall composition of tear gas is designed to disable humans – rendering them from being able to fully function upon exposure. This release also presents difficulty when removing from any impacted structure. Where tear gas is deployed, canisters are shot from launchers that heat the deployed canisters prior to its release, this helps increase area of dispersion more effectively. The particles that are released from the deployment are heavy and they settle eventually but can move from a powder state to gas under heat – which increases the likelihood of recontamination in the environment. Soaking a bandana or cloth in apple cider vinegar and tightly covering your mouth with it. Smearing lime or lemon juice on the inside of a cloth and tightly covering your mouth with it. Soaking a bandana in water and tightly covering your mouth with it. Smearing toothpaste under your eyes. 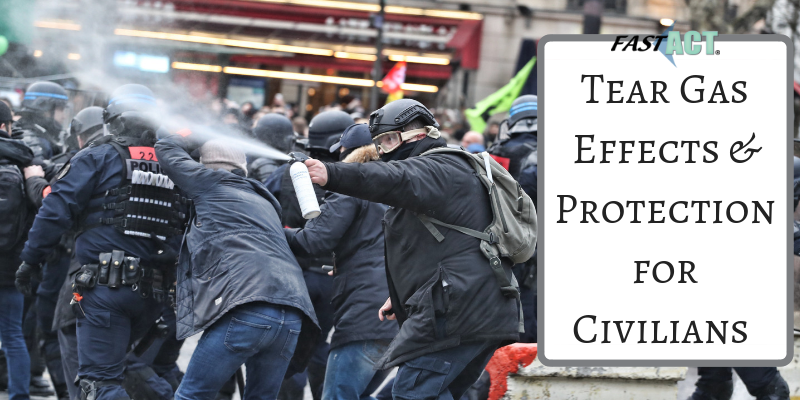 The chemical CN, utilized in tear gas is a potent, sharp, and irritating chemical that can be released into indoor air as fine particulate smoke, vapor, or liquid and due to the nature of this chemical many DIY protection methods simply fall short in providing real protection. For personal protection from tear gas, a protective mask is the best tool to implement. Tear gas is released into the air and can be inhaled or ingested when exposure occurs. In an effort to prevent chemical exposure and inhalation, utilizing a protective face mask can be critical. The FAST-ACT VapourKlenz Face Mask is ideal for toxic chemical vapor releases in the environment. FAST-ACT utilizes a patented earth mineral technology that is designed to attack and neutralize a broad spectrum of chemicals including chemical warfare agents (CWAs). Chloroacetophenone (CN), when dissolved in a solvent and released as an aerosol, FAST-ACT can interact with the compound at different active sites for neutralization. FAST-ACT also functions by knocking the liquid spray down when it has been released to an air space.